Not sure what we had in mind for grazing last night, Mike and I headed to Clematis Street, a few short blocks away from my home in West Palm Beach. We were drawn into The Alchemist Gastropub & Bar, a newly opened restaurant on the street. It is the latest addition to the Daiza Restaurant Group, which operates The Atlantic Fish & Chophouse and The Boathouse on Martha’s Vineyard, as well as the Atlantic Surf Club in Fort Lauderdale. I had been there a few nights before at an opening for downtown residents. I was impressed with creative food and drinks, as well as with the vibe. It is great to see more places on Clematis Street embracing live music. We were ushered over to a high-top and were soon greeted by Jamie Howland, a bartender who had been called in on her night off to fill in as a server to handle a larger than expected crowd. Obviously, word was getting around about The Alchemist and management wanted to make sure there were plenty of servers on hand. As I told Jamie that we were looking forward to grazing through the menu, she appeared to read my mind. 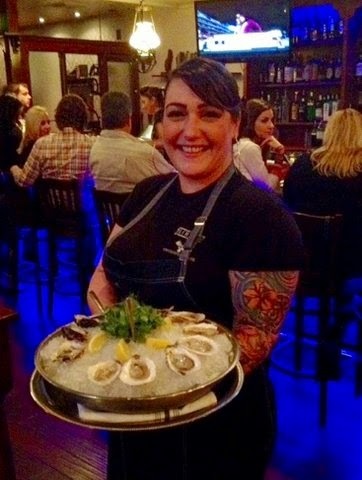 "Start with the oysters," she said with incredibly inviting grin. "You’ll appreciate how the blood orange mignonette crafted by Executive Chef Tim Farley brings out the flavors in our oysters." 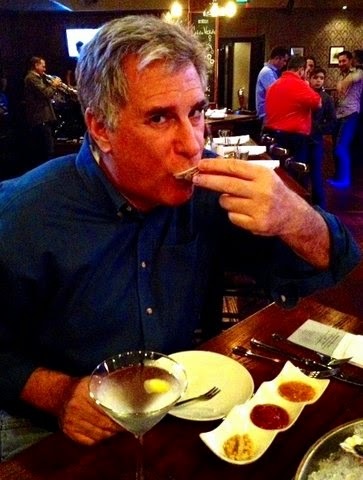 Mike, who had never tasted an oyster before in his life, was cautiously intrigued with her recommendation. And since I have a weakness for anything made from blood oranges, oysters were ordered. A platter of freshly shucked Royal Miyagis from British Columbia’s Strait of Georgia and Chilmarks from Edgartown Great Pond on Martha’s Vineyard promptly arrived along with the first round of our superbly chilled Finlandia Martinis. 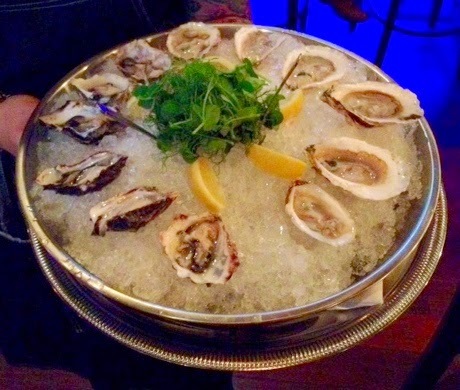 Generally, Pacific oysters are smaller than their Atlantic counterparts; however, that was not the case last night at The Alchemist. The slightly ruffled and lavender tinged white shelled Royal Miyagis were noticeably larger than the gnarly shelled Chilmarks. Mike, having no idea what to expect, requested a little direction from me. "It is simple," I advised. "Lift, tilt, slurp and chew." He watched intensely as I lifted the first Royal Miyagi to my lips. The smooth firm Royal Miyagi was sweet and slightly creamy, with a clean finish. Mike could tell from the expression on my face that I was pleased. "You aren’t going to use a squirt of lemons or either the sauces," he inquired. 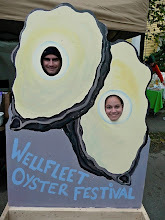 I explained that I prefer my oysters "naked" and always start out tasting each variety that way. So, Mike followed suit, raising a naked Royal Miyagi to his lips. He slurped, chewed and within an instant, he was sporting a wide grin. "Nothing like I expected," he told me. As this was not my first time with an oyster virgin, I knew better to ask what he had expected. "Let’s try them with the sauces now," he proposed. I reached for a cocktail fork and dipped it into the blood orange mignonette. It was chock-full of freshly diced shallots, which were perfectly complemented by the blood oranges’ juice and rind. I was semi-tempted to grab a spoon to snack on the sauce alone, but I resisted – for the time being. 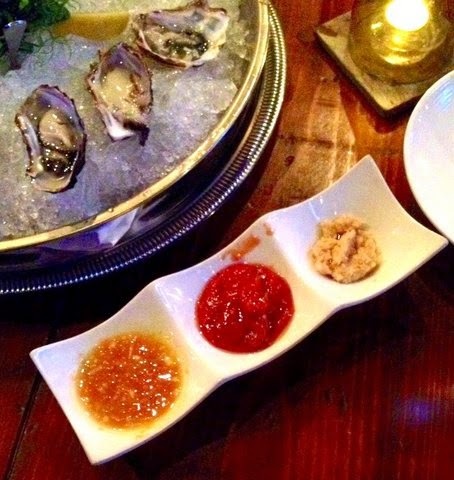 Using our forks, we lifted our next Royal Miyagis out of their shells and dunked them into the mignonette. After placing them back into their shells, we topped the oysters with a few strands of the mignonette soaked blood orange rinds, and slurped away. Now it was time for the Chilmarks. Sampling them naked, we found them to be significantly saltier. Yet they showed delicate flavor with a sweet aftertaste. Chef Farley’s slightly sweet pepperoncini cocktail sauce was still waiting to be sampled. We dunked our next Chilmarks, topping them with a touch of freshly ground horseradish. An other perfect hit for The Alchemist. Mike was enthralled by not only the concept of eating oysters, but also the amazing freshness and flavors of these two particular varieties. So, another platter was ordered. Jamie also insisted we try the Lobster Poppers, which are destined to be come one of my favorites at The Alchemist. "All fresh lobster," Jamie said, informing us that Culinary Director Martin Verano made sure that everything served at The Alchemist was as fresh as possible. "No canned lobster here." The Alchemist has it all: Great food and drinks, creatively crafted. Beautifully presented by stellar servers and bartenders. And just steps away from my home. What more could I want? When you go, tell them that Rand from Go Shuck An Oyster sent you.